Are you curious to know just how lightweight pop-up campers can get? The original idea behind pop-ups was to offer travelers a quick and easy camper that was a breeze to tow and which brought us closer to nature. Today, however, pop-ups come in nearly all shapes and sizes. So if you’re on the hunt for a pop-up, or are simply a curious reader, you’re in luck today. I’ve put this guide together for you so you can see how much pop-up campers weigh and if they’re suitable for you. Some offer hard-sided walls for extra protection with a kitchen, while others resemble a tent on wheels with only the basics. This will, of course, also influence the weight of the trailer. Pop-up camper trailers have been around for a long time. They are generally the more affordable choice when it comes to campers in general. But that doesn’t mean that they are the worst pick! The whole concept of a pop-up is that when you’re on the road, the trailer is folded in, or down, to take up minimal space. Then, once you arrive at your campsite, you can open it up and suddenly you have sleeping quarters and a small living area. Of course, this depends on the model you choose. A typical pop-up camper consists of a trailer frame, box, and a hard roof. On the inside, you’ve got pull-out bunks and soft walls. They usually also include lots of windows and screens, like this example from Forest River. The typical amenities that you get with a pop-up often include a convertible dinette, a freshwater tank, perhaps a gas stove, and a refrigerator. There are also premium models that include bathroom facilities. What’s great about pop-ups is the nifty use of space—everything serves at least two purposes. Take the dinette, for example. By day you can seat up to four people for a meal and then at night it folds down and becomes a comfy bed. Some models even offer you the option of taking some of the indoors out of doors. This is generally the stove and kitchen area that you can attach to the outside. Knowing the weight of the camper before you buy it is essential. Being aware of its weight can help you determine whether or not your vehicle is able to tow it, how much you can pack, how many people you can bring along, and so on. 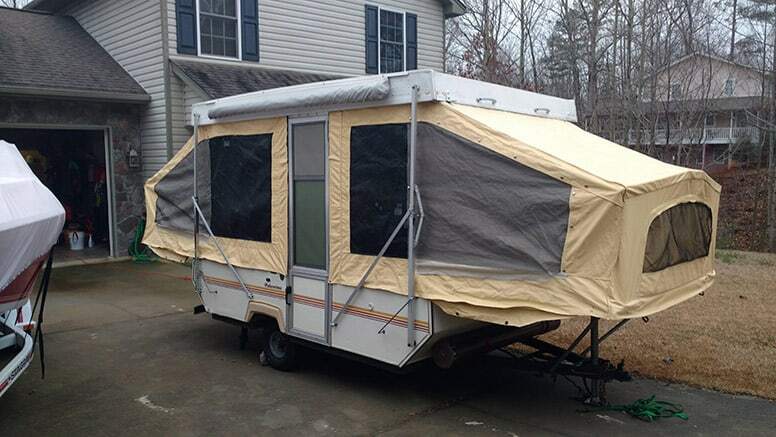 Pop-up campers are some of the lightest camper trailers you’ll find. The average weight usually sits anywhere between 600 and 2800 pounds. Pop-up campers have many weight categories, much like other trailers do. Generally, there’s a mini size, a medium size, and a large option. You must also take into consideration the material used for the trailer. This will have a great bearing on the overall weight. For example, if it has soft or hard walls, or a fiberglass or plastic roof. Mini-sized pop-ups can weigh as little as 600 pounds—like the Clipper pop-up from Coachmen. If you’re willing to go a little heavier, one example is the GO pop-up from Sylvan Sport. Mini-sized pop-ups are an excellent investment if you and your partner or friend don’t care too much about all the extras. All you need is the pop-up, a couple of fold-out chairs and a table, and you’re good to go. Plus, these mini-sized pop-ups are super easy to tow and won’t cause excessive wear and tear on your tow vehicle. Medium-sized pop-ups can weigh upwards of 1000 pounds. 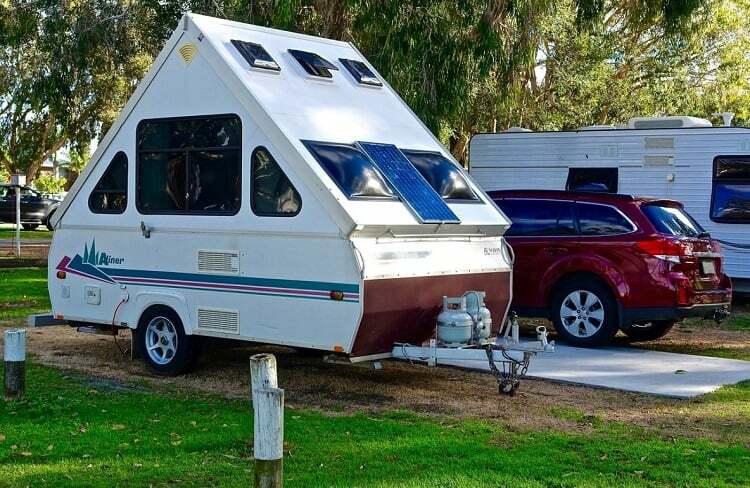 These campers offer you few more extras than the mini-sized models. Take for example the 8SD Jay Sport from Jayco, which weighs in at just a little over 1500 pounds. This pop-up trailer gives you two sleeping quarters, a dinette, small kitchen area, and lots of storage. You can still use a normal car to tow a medium-sized pop-up, which is also why many people prefer these. In the past, a pop-up camper’s box (the frame around the main living area) would usually only come in sizes ranging from 8 feet to 12 feet in length. Today, these larger pop-up boxes can be as long as 17 feet or more. When fully expanded, they can even reach up to 27 feet. These weigh more than the mini and midi-sized campers above. But they also give you more amenities. The extra towing weight is not too much of an issue for many people, though, because they’re still lightweight when compared to other campers. A good example of a larger-sized pop-up is the Flagstaff tent camper range from Forest River—these give you the standard pop-out sleeping quarters plus a slide-out. The UVW (unloaded vehicle weight) of the Flagstaff tent pop-up camper trailers can be as much as 2500 pounds. For these campers, you should make sure your current vehicle can tow this weight before committing to purchase. A lot of factors can influence the weight of your pop-up trailer. It depends greatly upon what the manufacturer has included inside, and also the materials used for the construction. For example, two pop-up trailers of the same length can, in fact, have quite a significant difference in weight. On the contrary, smaller pop-ups with fewer amenities can also outweigh a larger one. It all depends on the materials used. If we take, for instance, an all-aluminum pop-up trailer, this will weigh much less than those constructed from heavier metals. However, one great thing about pop-up manufacturing is that companies are always trying to make them lighter and more convenient for travelers. Below are a few examples of how. Most pop-up campers require you to raise the roof before you can use it. This is generally what you see in lighter models. The original lift system included a pulley, springs, and other devices. However, this was found to take up a lot of weight, so—in order to reduce it—manufacturers came up with a clever lift system. The new innovative method consists of a clutch controller winch that connects via a cable to the pulley. Once you engage it, it will help raise the roof. Whether it’s a pop-up, fifth wheel, or motorhome, the weight of the roof is critical. These should never be too heavy. A plastic roof seems to be the favorite, because it is so lightweight. Still, many are made of fiberglass, since it is low maintenance, when compared to a plastic roof, for example. Rubber roofs were once popular but they tend to leak after a few years if not looked after properly. When it comes to the floor in a pop-up, there are usually three options: vinyl, carpet, or laminate. The choice of material can have a noticeable impact on the overall weight of the camper. Vinyl tends to be the favorite because it’s lightweight. However, it can be difficult to install. Very rarely is laminate the choice in pop-up flooring, since it is significantly heavier. And last, but not least, we have the good old carpet. Although this is usually the favorite when it comes to touch and insulation, it can be tricky to keep clean. Carpets are notorious for gathering dirt and dust. Plus, they are not as lightweight as vinyl. Are Trailer Brakes Needed for Pop-Ups? Small pop-up trailers with a gross vehicle weight rating (GVWR) under 3,000 pounds are not required to use trailer brakes. For the lightweight trailers, the brakes on your tow vehicle should be enough. Any trailers with a GVWR of more than 3,000 pounds should have a braking system that engages all wheels. Most vehicles capable of towing should have a brake controller already installed. But if your vehicle doesn’t, you can quickly get one from your RV dealer, mechanic, or places such as U-Haul. Pro Tip: Most experts recommend that you use trailer brakes for any campers weighing more than 2,500 pounds. Most will probably already have the option, and it will be safer for you. Can My Current Vehicle Tow a Pop-Up Camper? As I mentioned earlier, you can tow a lightweight trailer with pretty much any vehicle. In fact, with light trailers, you can actually use a motorbike. Still, it’s important to make sure, before buying or renting, that your vehicle can tow your trailer. Unloaded Vehicle Weight (UVW): This is the starting weight of your trailer. It includes the weight of the hitch, axles, and a full LP propane tank. Cargo Carrying Capacity (CCC): This indicates how much weight is available for cargo, fresh water, accessories, and other equipment in the trailer. Gross Axle Weight Rating (GAWR): The maximum cargo weight that the camper’s axles can safely support. Gross Vehicle Weight Rating (GVWR): This includes the weight of the hitch plus everything inside the towing vehicle, including passengers, extra cargo, pets, and whatever else you’re bringing in the car. When determining if your vehicle is capable or not, many recommend that you check the owner’s manual of your car. Keep in mind that the total towing capacity of your vehicle includes everything that you will tow, plus all the cargo and passengers in your car. Pop-up trailers are the perfect pick if you love getting close to nature. These campers can weigh anywhere from 400 pounds all the way up to 3,000 pounds and more. Pop-ups provide you with just enough essentials, in a neat little lightweight package, ready to take on the road. For the most part, you won’t need to upgrade your vehicle. But make sure you double-check before buying or renting. Do you think a lightweight pop-up trailer is the camper for you? If you already own one, what’s your opinion? Please share with us in the comments below. And if you found this article helpful, make sure you share it with your family and camping friends.